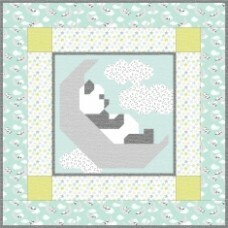 This is quilt pattern for an adorable and easy to make baby quilt, perfect for a shower gift. The instructions cover everything from fabric yardage to binding the quilt. My patterns are made in a stripped and pieced method great for beginners. I use charts for the cutting instructions. First, with the yardage and given number of strips to cut for each color fabric. Second, a set of charts giving the cross-cut lengths for the pieces, each label alphabetically. Then you will follow a full page labeled color image of the quilt top. The shaping is done with half square triangles in the quick corner method. The entire top is sewn with straight 1/4" seams. There are some helpful videos on YouTube for those need assistance here. 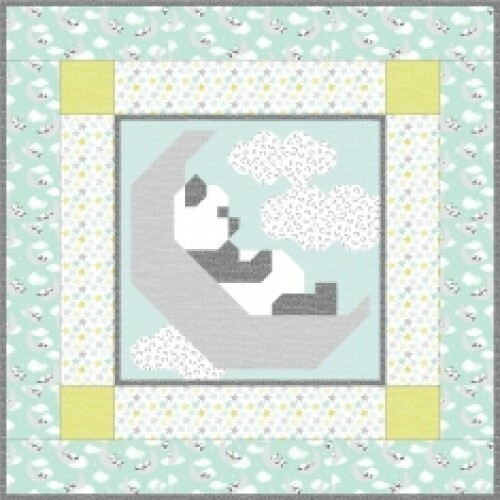 This inner image of the panda is 24x24 inches. The outer borders are 5 inches each making the quilt 35x35, then 45x45, so you can easily make it a smaller receiving blanket. Want to get started today? You can! You are ordering a 4 page, PDF format, COLOR quilt pattern to be downloaded once payment has been received and then printed by you.